Drying Tack - Buy Drying Tack Product on Hebei Reking Wire Mesh Co.,ltd. Drying frame (drying frame) is also known as silk screen. It is suitable for printing, gluing, painting, coloring, and drying and placing equipment after sputtering. The movable multi-layer grid design has large space for installation, convenient operation, saving workshop and warehouse area, and can be applied to the room temperature drying of the placed products and the high temperature baking of the furnace. 10cm mesh; mesh diameter 5mm × 3mm; layer height is divided into 50mm and 25mm. The base is equipped with a four-inch universal wheel, which is convenient to move. The mesh is generally colored galvanized and sprayed. Because of the different uses in various fields, various specifications can be customized. 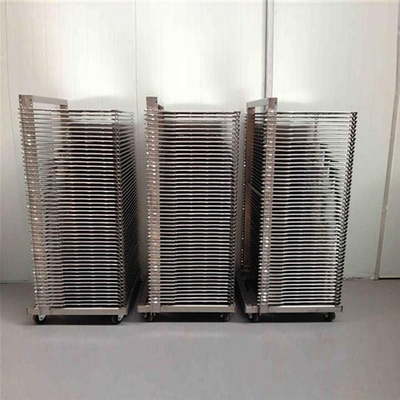 Widely used in silk screen printing factory, transfer heat transfer factory, printed circuit board factory, electronic processing factory, jewelry factory, shoe factory, belt leather factory, anti-static equipment factory, wood coating factory, stained glass, dry paste, medium and large Furniture factory, Baizhong window factory and so on.